Looking for a fun escape? Bring your favorite ladies to Frederick for the perfect opportunity to relax, refuel, and explore this unique destination! 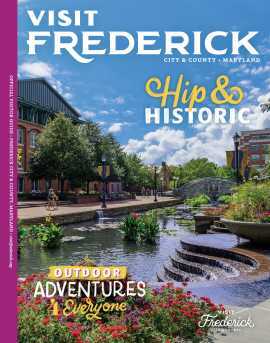 This itinerary covers some of the best highlights of Downtown Frederick. And the best part? It can all be done on foot! Walk the streets of Maryland where Francis Scott Key once lived, worshipped, practiced law in the early 1800&apos;s, and visit the final resting place of the man who penned the Star-Spangled Banner on this regional tour of Francis Scott Key highlights. From "saintly" Elizabeth Ann Seton to the notorious Blazes Still, Frederick County is rife with do-gooders and not-so-do-gooders. Here&apos;s a tour full of heavenly fun and a devilishly good time. Civil War docs and locally brewed beer are the theme as you taste and tour through Frederick&apos;s fiercely contested ground during the Civil War. Become acquainted with over two centuries of African American heritage in Frederick County. Trace the roots of religion in Frederick County by visiting a variety of religious and historic houses of worship, which are sure to inspire. Travel through the rolling hills when the leaves are at their peak! Agricultural Tours: wineries, breweries, distilleries, farm markets, orchard tours and restaurants serving locally raised produce, dairy and meat products are all available to have a farm to table experience. Student Tours: Less than 45 minutes from Washington, DC, Gettysburg, and Baltimore, Frederick County makes an ideal home base for your student tours. Religious Pilgrimages & Mountain Retreats: Tour the National Shrine of Elizabeth Ann Seton, or experience the serenity of the Grotto of the Lourdes, in the foothills of Catooctin Mountain. Soft Adventure Tours: From the C&O Canal, to the Blue Ridge Mountains, to the untamed beauty of the Potomac and Monocacy Rivers, Frederick County offers a wide range of recreational tours, including rafting, canoeing, biking and hiking.